Michelle still lives in the same Southeast Florida area where she grew up and learned to fish in the canals and man-made lakes near her home. They weren’t targeting a particular species — Michelle and her dad would just see what they could pull out of the water. Michelle didn’t try saltwater fishing until several years later. She hasn’t done a whole lot of canal fishing since getting her first taste of saltwater reeling. While she tries to do a little inshore fishing when she can, Michelle is generally an offshore angler. Although she is typically an offshore angler, the ride is not a long one to get to the fishing grounds. In the summer they may head out to the Gulf Stream hunt for bigger fish, in particular, mahi. She enjoys the challenge of fishing for mahi mahi — and, as an enthusiastic seafood chef, the rewards. Michelle also loves chasing sailfish. Costa Rica is also where Michelle had one of her most memorable catches. She managed to get it to the boat and get a photo op before releasing it. 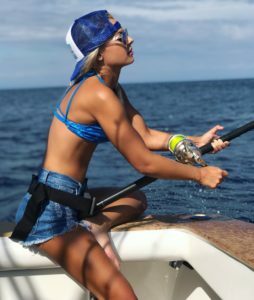 But Michelle only has time to fish for pleasure when she’s not fishing a tournament or heading to a destination with her Pelagic Fishing Team. At the same time, enjoys being an ambassador for the sport, especially when it comes to encouraging more women to pick up a rod and reel.